Always patriotic, Salvatore Calabro loved his country and could spend hours reading up on the history and heroes of World War II and the Vietnam War. World Trade Center with seven comrades from Ladder Co. 101 in Brooklyn, he was wearing an American flag patch on his uniform. Calabro, 38, is among the missing victims of the attack, and would be proud to see the patriotism that has swept the country. "He was always wearing American flag T-shirts, watching the History Channel and reading about the Vietnam War and World War II," said his wife, the former Francine Carillo. "The firefighters had a firehouse patch on one side and an FDNY patch on the other. Sal had the firehouse patch on one side and an American flag on the other. The flag was on his uniform sleeve and his turnout coat. He was a real American." 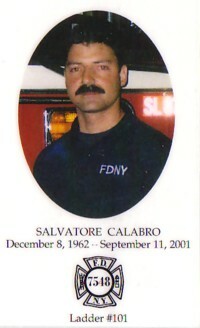 Mr. Calabro had just finished his shift on Sept. 11 when Tower 1 was hit. "The last time I spoke to him was the night before," Mrs. Calabro said, explaining he had just finished working a shift for another firefighter. "He was supposed to be coming home, but he just jumped on the truck." His brother, Richard, a city police detective, helped in the rescue effort following the attack. Mr. Calabro achieved his lifelong dream of becoming a firefighter on Sept. 14, 1987, and spent his 14-year career with Ladder 101. He was a member of the department's Columbia Association and a union delegate. Retired Lt. Jim Manning, who was a firefighter with Ladder 101, said from the moment Mr. Calabro entered the firehouse as a probie, he wanted to learn everything he could about fighting fires. "Sal was an excellent firefighter," said Mr. Manning, who retired last year out of Engine Co. 155, New Brighton. "He was very conscientious and always willing to learn. He was a fast learner and always wanted to excel. He passed on what he had, what he learned to the younger, newer firefighters. It was important to him that they learned it and passed it on, too." Always looking to make his company the best it could be, Mr. Calabro was willing to participate in drills any hour of the day or night. "When you were in a crowd, you always looked for Sal's face first," said Mr. Manning. "When we had to attend departmental wakes or funerals, it was always better if Sal was there. We knew everything would be OK if he was there. We could really use him now." Mr. Calabro's catch phrase was "You're the best." "Whenever he said that, everyone would respond, 'No, Sal, you're the best.'" As much as he loved his job, Mr. Calabro was happiest watching his little boys grow up. Four-year-old Daniel and 2-year-old Alexander James (A.J.) were his pride and joy. He coached Daniel's T-ball team at the South Shore YMCA. When he couldn't be with his boys, Mr. Calabro would call several times a day to see what they were up to. Mr. Calabro and his wife met as teen-agers, when they were both working in a Brooklyn supermarket. "We've been together ever since," Mrs. Calabro said. They married Sept. 16, 1989. Born in Brooklyn, Mr. Calabro moved to Eltingville in 1993. He was a parishioner of Holy Child R.C. Church, Eltingville. He attended Brooklyn College, where he played football. He also attended the Gemological Institute of America, Los Angeles. Prior to joining the Fire Department, he was a diamond setter in Manhattan's diamond district. A fitness fanatic and sports enthusiast, Mr. Calabro played on the Fire Department's football team in 1993 and also played intramural ice hockey and softball for the department. He loved to ski the slopes at Hunter Mountain. An excellent cook, Mr. Calabro also earned a medal for his wine making. In addition to his wife, Francine; his two sons, Daniel and A.J., and his brother, Richard, Mr. Calabro is survived by his father, Carl, and another brother, Carl. A memorial mass will be held Monday at 1:30 p.m. in Holy Child Church.